There was recently an article in Slate on the topic of the effective of robo-calling versus text messages, and discusses in some detail the ways that A/B testing is used in the political world. I previously wrote about a similar topic in my blog post Obama and McCain: How political marketing has evolved from offline to online. Why look at political marketing strategies? How would you sell bottled water? That is, given a completely commodity product like water, companies like Evian, Fiji, Voss, Arrowhead, and others manage to sell a product using a fundamental pillar of branding: STORY. I find politics interesting for the same reason, because it’s all about storytelling and narrative. I wanted to point everyone to a recent story in the New York Times on the difficulties in establishing a narrative for McCain, in the article titled The Making and Remaking of McCain. Worth reading. Now the article in Slate had some interesting passages that I wanted to highlight, on cost per acquisition, split testing to encourage voter turnout, and other fundamental ideas that every quantitative marketer should have in their toolbox. Robo-calls are the pyrotechnics of politics: They create a big disturbance, but they don’t have a prolonged effect. Numerous studies of robo-call campaigns show that they’re ineffective both as tools of mobilization and persuasion—they don’t convince voters to go to the polls (or to stay away), and they don’t change people’s minds about which way to vote. So why do campaigns run robo-calls? Because they’re cheap and easy. Telemarketing firms charge politicians between 2 and 5 cents per completed robo-call; that’s as low as $20,000 to reach 1 million voters right in their homes. […] Text messaging is different: We pay attention to short messages that pop up on our phones. 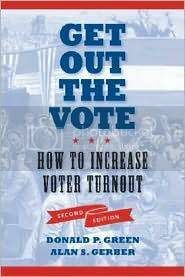 These conclusions arise out of work by Donald Green and Alan Gerber, two political scientists at Yale whose book, Get Out the Vote: How To Increase Voter Turnout, is considered the bible of voter mobilization efforts. Green and Gerber are the product of a wave of empiricism that has washed over political science during the past decade. Rather than merely theorizing about how campaigns might get people to vote, Green, Gerber, and their colleagues favor randomized field experiments to test how different techniques work during real elections. Their method has much in common with double-blind pharmaceutical studies: With the cooperation of political campaigns (often at the state and local level), researchers randomly divide voters into two categories, a treatment group and a control group. They subject the treatment group to a given tactic—robo-calls, e-mail, direct mail, door-to-door canvassing, etc. Then they use statistical analysis to determine whether voters in the treatment group behaved differently from voters in the control group. Anyway, I won’t quote the entire article, but I personally found it pretty fascinating. Anyway, the coolest part to me in all of this is the interplay between the soft stuff and the hard stuff. The soft stuff is the candidate, including brand, the speeches, the fashion, the messages, etc. The hard stuff is figuring out, once you have the candidate that you’re meant to market, how to break everything down into Dollar per Vote (which sounds kind of sinister when you put it tha way). Or perhaps, you could even calculate it down to Dollar per Electoral Vote. Really this is a measure of the efficiency in which a well-run campaign is able to put the donations raised into the raw results tha they want. Anyway, if anyone’s read other interesting perspectives on quantitative marketing in the political realm, I’d be interested in hearing about it.